Bluebird of Happiness in Inktense Watercolor Pencils (and 100 Face Challenge #67)! In yesterday’s post, we took a look at Derwent’s Graphitint line of water soluble pencils, which is ideal for subjects in the natural world, because water-soluble graphite is included along with colored pigment in every pencil. Welcome to Inktense, Derwent’s vibrant line of water soluble ink in pencil form! 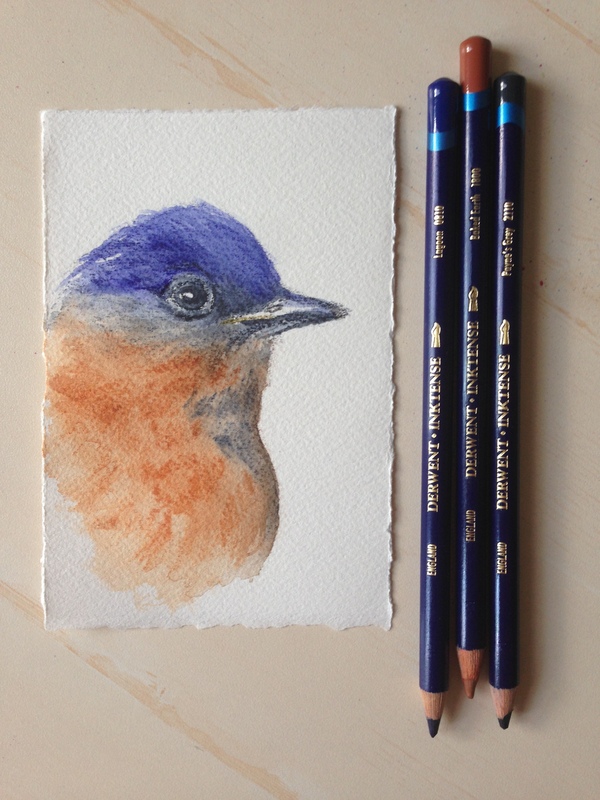 Thanks once again to Kathy at Backyard Bird Nerd, for her lovely bluebird image that allowed me to sketch this beauty’s head closeup, using only three colors from the set! I find watercolor pencils a quick, fun, and easily portable way to enjoy art anywhere. Simply sketch your subject as you would with a pencil, liquefy with a brush, and you can be on your way in no time. Pigment lifts much like watercolor, with a dry brush or a bit of paper towel. The interesting thing about Inktense pencils is that they are made with water-soluble ink. This means that once they are liquified and have dried, they are now permanent on your surface. So if you’d like to layer on top of them with more Inktense or, for that matter, any other medium, the underlying layer will not move on you. This is a nice bonus when you’re used to working with watercolor! For a better buy per pencil, the sets start at 6 to a pack and go all the way up to the full range of 72 pencils. They are also available open stock, so if you’d like to try them without buying a whole set, browse my color charts for colors that look good to you and build your own set with singles! The best per unit deal of all of the sets at Blick right now is the set of 24 for about $26. The colors are very vibrant, so a little goes a long way! Can anyone smell a barbecue?? I can hear the band starting to warm up for a lovely Fourth of July weekend and weenie roast! Who’s with me? Peace and paint puddles to all! 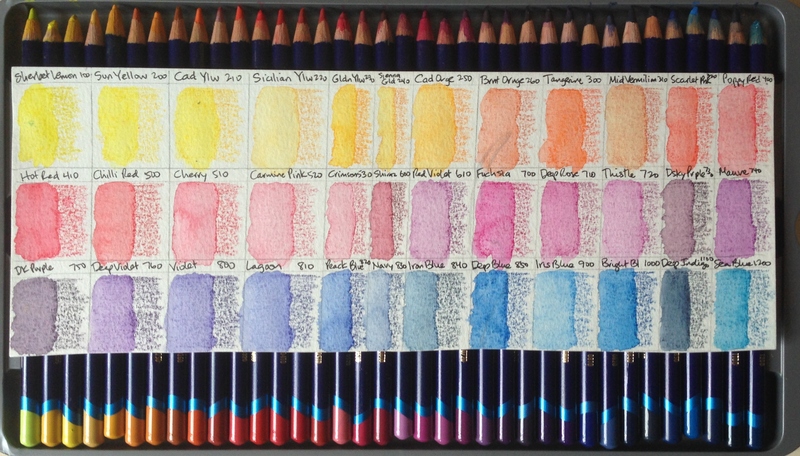 < Watercolor Pencils for Nature Lovers (and 100 Face Challenge #66)! THAT explains, how you are So good with Birds!!! here, there’s some tiny birds- blue fairy wren; willy wag tail; pardalotte (sp.)? that are sooo Cute!! willy wags his ‘tail’ its so funny. That little bluebird takes my breath away! Your ability to capture animals artistically is exquisite. The eyes always give me a glimpse of your tender loving soul and spirit. To create the life in an eye like you do is like a mirror of your beauty. I love what you’re doing with watercolour pencils! Your bird is awesome! Love the sketch, the colours are great. Thank you so much! Just love Derwent products! Thanks, Cathe. He was fun to sketch, Kathy’s birds are just the best! So much personality and flair. Many of her bluebirds are grumpy so I had to find a content one lol. Love their expressions! Just a scrap of paper…and all of a sudden there is a bird looking at me! Thanks so much, Johanna! Really enjoying my face challenge; eyes are my favorite thing to draw! Laura – I LOVE this one. This would make the perfect note card. One day, when you have oodles of free time on your hand, you need to do a whole set of nature note cards with close ups like this one. I will be the first customer! Kathy, if I ever do them they will be free to you, as without your photos, I couldn’t do them! Your work is amazingly detailed and your birds, as I always say, have personality plus! They make everyone want to look at them. I have actually thought about doing a series of close ups, and I really appreciate your encouragement in that regard. Would be glad to send you a box on the house! Thank you again. Really glad you love this one so much! I’m not sure that the texture of the paper helped me much with this one. I’m thinking about hot press paper for the next go-round. It is much, much smoother. I’d love to get your thoughts on this, Kathy. I don’t really know what hot press paper is, so I will have to compare the two when you use it. I kinda like the rougher paper though – I think the texture is what made me think note card. If you were doing a drawing/painting to hang on the wall then I would think smoother paper. And again…I know you are gifted in all kinds of art, but I honestly think anything with eyes is your forte! Hot press paper is almost perfectly smooth. You can see the texture in this one, but I don’t think you would on the HP paper. I think the HP would make it easier for me to do any type of detailed work. For wet paint from the palette (vs. from these watercolor pencils), I think a textured paper like this is better because there’s so much more liquid involved. Thanks re: your comment about the eyes. I do think I prefer subjects with eyes to almost anything else. I don’t feel as confident painting things with eyes though, and I’m addicted to color. That’s where I run into a snag. The pencils do help with precision, but I’d love to be able to feel like I could paint any face, and do justice to it. That would be the ultimate, for me. Thanks for your thoughts, I appreciate it! She truly should! Thanks, Kerfe. Wow, Laura, such a beautiful painting! Inktense blend so well yet are terrific for layering for more detail and depth, like you expertly did in the rust-colored feathers. I love my Inktense pencils and started with the smallest set, but I have added to it slowly with open stock. I am so happy that you are pointing out that art can be approachable and affordable. This medium allows a bit more control, making it perfect for beginners. Happy Wednesday! Thanks so much, Carol, and I agree with you – so much easier for the beginner to start with these, or something like them, depending upon how vibrant they’d like their colors to be. Maybe I should go for the trifecta and show my standard Derwent line of watercolor pencils too, which is between the Graphitint and this Inktense line in terms of intensity. Honestly, if I were more talented and practiced, I have seen artists do amazing things with watercolor pencils. But for the beginner…..so much easier than trying to figure out how to mix the colors, etc. Although that’s not really hard either! But it can be a lot to learn all at once. Thanks again, Carol. You’re right, we all have them, but we just need to find which ones we have! It feels like being in one of those adventure games at times lol. Gorgeous, Laura! I’ve got some Grphitint and some Inktense pencils and I don’t get on with either, especially the latter, but what you do with them is truly inspiring. Aw, thanks, Michael. I am really not all that good with them; I was just telling Carol that I’ve seen artists (like Cathy Johnson, for one example) do amazing things with watercolor pencils. I’m trying to encourage beginning artists to join us for WWM in July, and, for me at least, wc pencils are a good opener for pans and tubes. Thanks for stopping by and commenting, means a lot. It’s a beauty! Love the bright, vibrant colors. Thanks so much, Teri! It’s what I love about these too! And the permanency, really can’t be beat in this medium. Glad you enjoyed him. I love your birds. You are good with those little guys. Their eyes!!!! I will post a pic of my little boy dog Larry for you. You don’t have to draw him, but you got to see his pet. If you wanna draw him, his eyes are good in this. I will post it now for you. 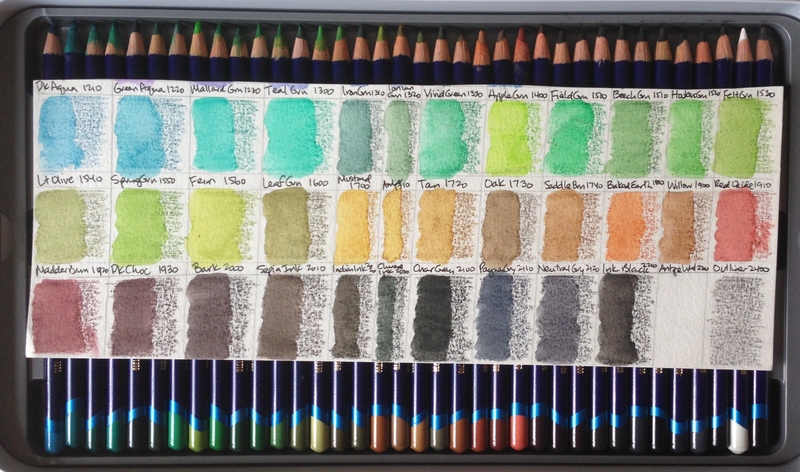 Saving for my set of Inktense pencils now! Oh yay! So exciting! Oh, you will love them. Of all of the wc pencils I own, those have had the most use. You really can’t beat the colors and the permanence! And Derwent has a really good name, been around for centuries I think! Hard to go wrong with them! Hey I’m curious if you have visited Peta Hewitt’s website or YouTube channel? She has some wonderful Inktense tutorials. La-artistino.com I think you might enjoy it. I’m also curious if you can recommend a decent watercolor set? I’ve been looking at the Sakura field set or the koh I noor color wheel set. Big price difference but I’m looking for a paint that will layer and mix colors unlike the chalky cheap set I have now. Any thoughts? I’ll have to check her site out, thanks! Here is a link to a recent post where I discuss the watercolor set I started with – and still enjoy using after nearly 2 years. https://createarteveryday.com/2016/06/27/getting-ready-for-world-watercolor-month-in-july-100-face-challenge-65/ If you need anything else, let me know! Thanks so much, Deborah! I really enjoy birds and dogs best, I think. I could sketch eyes all day. Love this cute birdie and colors too! Thanks, Snehal! I was wondering what you’d think of the Inktense line. Much brighter than the Graphitints, and then there is another line somewhere in the middle – which was the first set I bought when I started out in art. I may do a bird in those too hehe. They are not as bright as these, and are not permanent when dry as these are. Fabulous post, Laura!!! 😍Love that bird and those swatches make me want to grab some pencils and go to town!! Fun!! Thanks, Charlie! So glad you enjoyed him! Loving the watercolor pencils. Those birds are great. Good job! Gorgeous blue bird, the pencils added some very nice texture to the feathers…another frame worthy piece. Thank you for the information on the Inktense pencils, very interesting. As always, you do inspire, thank you for sharing. Thank you, Haunani, much appreciated!